How to explain this… it’s February 1949, the dreaded recording ban that curtailed studio activity for the bulk of the previous year is now over. Artists can finally take advantage of the creative advances made over that time by cutting new material to appeal to the rapidly expanding rock audience. Yet for some reason the biggest hit-maker in rock during 1948 – Sonny Thompson – is STILL releasing sides made at the tail end of 1947. You’d be entirely justified in asking: Is it any wonder why Miracle Records soon went belly up? Before we jump to any rash conclusions though it’s important to point out that in spite of its early vintage – and its mild content – Sonny Thompson was SO hot that it didn’t matter much when he recorded it, as this STILL hit the national Billboard charts, albeit for a lone week (though it actually topped the Cash Box regional charts in St. Louis and New Orleans). But minor hit or not the bigger question is what effect this step back in time musically had on his career momentum going forward and whether it was worth the trade off for all involved. Before Long Gone, was released in March 1948 and promptly zoomed up the charts to #1 Thompson was seen by Miracle Records as little more than a highly capable studio musician whose primary job was to back the label’s motley crew of assorted commercial lightweights. His own recording career seemed little more than a carrot on a stick to convince him to tolerate the long hours playing behind the likes of Browley Guy and Gladys Palmer, names that I’m sure need no introduction… to their immediate family that is. Thompson, along with the cleverly named Sharps & Flats, had put together some infectious instrumentals in the fall of 1947 but had to wait four months for the first – and best – of which to see the light of day. When it became the hottest record in black America Miracle Records was in a bind. They’d never expected such a thing and weren’t exactly prepared to capitalize on it. Now maybe they should’ve merely done what other small independent labels were doing the latter half of 1948 and send their artists to Europe to record so they could avoid running afoul of the musicians union edict that stopped all new recordings in America that January (“Europe” being record business code for the hinterlands of New Jersey, where sessions were cut on the sly in defiance of the ban). But maybe because Thompson was a member in good standing of that union and his name would be on the record itself, as opposed to being merely an anonymous backing pianist for some vocalist, he turned down that offer if made. My guess is that no such offer was forthcoming by Miracle because of what we’re seeing transpire now. The company DID have other Thompson led sides in the vault and came back with Late Freight in August and that too hit #1 on the charts, so I’m sure Miracle Records felt there was no need to get into dutch over trying to strike while the iron was hot and get a few more recent sides down on wax. By the sales returns I guess they were right… to a point. But we’re AT that point now and it was called 1949 which was a long ways off from 1947 and with the changing of the seasons (five of them thus far, including two winters) the music landscape had progressed considerably, in large part thanks to Thompson’s work that added a new wrinkle into the sonic textures of rock ‘n’ roll after which others had taken those sounds and advanced them even further thereby rendering the freshest ideas from late 1947 a bit stale. Miracle was down to what they themselves had deemed the weakest of Thompson’s sides but rather than waste them they released Blue On Rhumba and hoped for the best. They were indeed correct in their original assessment of the quality of the respective sides in Thompson’s late 1947 arsenal of songs. 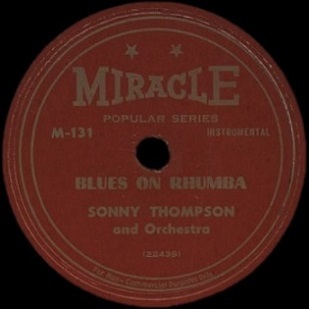 Blues On Rhumba WAS the one with the least commercial potential, but that’s all relative because as stated Thompson was so scalding hot (both his previous records were still charting in early 1949, the first one EIGHT FULL MONTHS after being released!) that it hardly mattered. Audiences were going to buy it just to hear if his winning streak would continue. It wouldn’t. At least not aesthetically. That’s not to say it’s completely unlistenable, but it’s hardly the sound that had propelled Thompson and crew to the forefront of the rock conga line last year and for an audience that had been waiting since last August to hear something new from Thompson, to instead give them something OLD… and not just old but also out of step with his previous work… was disturbing / arrogant / foolhardy (take your pick). Making it even more bewildering was the fact that the recording ban ended officially in the middle of December and record companies were cutting new sessions around the clock to make up for lost time. Yet at Miracle Records they apparently were too busy counting the checks from Thompson’s previous two hits to bother with such things as straightening up the studio, turning on the equipment and waking the engineer so they could get themselves FUTURE hits. So we’re left with warmed over also-ran from 14 months prior to try and compete with the best of the newly recorded sides by his staunchest competitors on the hit parade who were putting out sides that updated and refinded the sounds that had gotten them all this far to begin with. Thompson meanwhile could only sit and watch as his star, the brightest in the sky for the past twelve months, dimmed considerably. One week in the last spot of the Best Sellers list was hardly maintaining his lofty position. The key component of both Long Gone, and to a lesser extent Late Freight, was how those records utilized “the groove”. A vaguely defined but easily identified musical attribute which substituted a catchy trance-like repetitive rhythm for more varied melody and flashier technique the groove was perfect for connecting with young rock fans who were mesmerized by rock’s unique traits in comparison to the more traditional components of pop, jazz and even blues. Perfect for dancing yet also ideally suited for solitary listening when you could lose yourself in the music, Thompson’s records were idiosyncratic minimalist gems utterly distinctive even compared to the rest of rock’s output, yet featuring the same component in Eddie Chamblee’s tenor sax which defined so many other rock hits of 1948. Now it’s one thing to re-enter the studio after such runaway success in one specific style and have a restless creative urge to branch out some and not merely repeat the same formula. Had Thompson and crew done that and the results hadn’t been up to par, well you could at least understand their mindset in doing so. Nobody wants to be seen as a one-trick pony and if ever there was a time in which you’d have the leeway to step a bit outside of what’s expected and indulge in your more ambitious ideas it’d obviously be when you were coming off two consecutive #1 hits and could more or less call your own shots. But of course we know that’s not the case here. Blues On Rhumba wasn’t some indulgent stab at artistic credibility following the shallower commercial successes, it was merely the leftovers from the period that produced those commercial successes. A different type of song for a slightly different type of audience, which is what makes its release now so inexplicable. If the previous two records by Thompson could be called the pinnacle of “groove music”, then Blues On Rhumba is best described as “mood music”, which as we know is an entirely different thing. Not a bad thing, especially when played by musicians who were not aspiring to swanky supper clubs, but rather it was a much more elusive sound with which to try and lure in the rock audience. You can almost picture the fans who literally wore out the last two Thompson records rushing out to buy this expecting more of the same, or better still, a record which built off those and took the concept even further. As they let the needle fall and waited for the sounds drifting out of the speaker to come together their eyebrows furrowed, their head cocked sideways, their lip curled ever so slightly as they tried to make sense of what they were hearing. Thirty seconds in, as the simple left hand pattern on piano sets an anticipatory mood, the listener is on the edge of their seat, certain that what is to follow will launch them into orbit. Though the intro is far more stark than they’d have expected it’s not without some intrigue and it does retain a bit of a groove-like (or groove-lite if you prefer) sensibility to it. But when the main heft of the song comes along at the forty second mark the air is let out of the balloon and those who’d laid down their 79 cents for this expecting something gritty and infectious did a double take, checking the record label to see if perhaps they bought the wrong record, maybe Sonny Tompkins or Sammy Thompson instead of the artist who’d given them some of their greatest musical pleasure the previous year. Where Have You (Long) Gone? The reason for this vastly different sound should be evident, not by Thompson’s name adorning the label but rather by whose name is absent, that of Eddie Chamblee. On both Long Gone (Part Two) and Late Freight it was Chamblee’s added presence to the group which transformed those records into something more spellbinding. His smoky tenor sax weaving through the solid rhythms laid down by Thompson’s piano and The Sharps & The Flats adding their quirky textures elevated those records, giving them an added quality that not only tied it in with the best sides from other rock instrumentalists of note at the time – nearly all sax players don’t forget – but also gave them a multi-layered sonic palette which allowed the underlying groove to be better appreciated. Here the role that was handled so capably by Chamblee is instead given over to guitarist Arvin Garrett who plays with such a slack touch that it sounds like a country-bluesman simply wandered in off the street and sat in with them rather than a veteran of a more urban-rooted combo where Garrett had made his name. The playing isn’t bad, but it’s not suited for the audience that was going to be waiting anxiously for Thompson’s records at this point. Without Chamblee to give the record the same overt feel it was up to the substitute lead instrument to offer a suitable replacement by playing with more bite and energy. Instead he sounds half asleep and while the song was designed to be a slow-paced rhumba there’s not much call for lazy rhumbas at rock ‘n’ roll dances. Miracle should’ve known this and steered clear of releasing it, especially at this juncture when it was no longer necessary, or at least simply issued it as a B-side to something cut recently. Had the recording ban lasted another year and they needed anything they could get with Thompson on it to put out then it’d have been understandable, even though the end result wouldn’t change unless the audience themselves changed in the interim. Blues On Rhumba is modest and unassuming, not unpleasant to hear and unlike a lot of records we pan around here, especially as we get further along the road from rock’s birth, we’re not saying this is behind the times musically, stuck in another era thanks to an outdated arrangement. Considering when it was recorded – in December 1947 – that would certainly be what you’d expect but it’s not the arrangement itself that does this in as much as the different intent the band had when recording this. This is the sound of a group unaware of rock’s imminent takeover, one they themselves contributed to. It’s the sound of an alternate reality, one where some rock attributes remain but where it was expected to dress up and act more mature, less urgent and impatient, thus less captivating. If you want to know what the black music landscape would’ve looked in 1949 outside of jazz, blues and gospel had rock as we know it not taken over quite so emphatically Blues On Rhumba is probably a pretty good approximation of that sound. But in the world that they all found themselves in during the winter 1949, where rock was now firmly entrenched, this is merely a murmur in the darkness outside the juke joints where everybody was still grooving to the last sides Thompson had scored with months and months before, but which still sounded far more fresh than the mild trifle served up here. Leave a reply on "Sonny Thompson: “Blues On Rhumba”"